A legendary rivalry with a UNITED purpose. Two Communities come together for one cause. 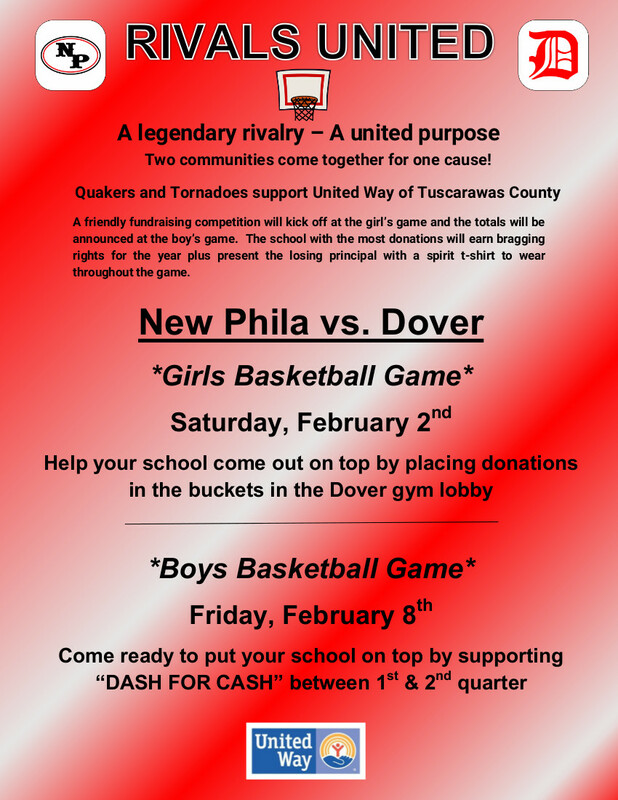 Quakers proudly support the United Way of Tuscarawas County and will be participating in a friendly fundraising competition with Dover to see which school can raise the most donations for United Way. The School with the most donations will earn bragging rights for the year and will present the losing principal with a Spirit T-shirt to wear throughout the game! Donations can be made at the girls New Phila vs Dover Basketball game on Saturday, February 2nd and during the "DASH FOR CASH" (1st & 2nd Quarters) at the Boys Basketball game on Friday, February 8th.